The season will bring some new opportunities for our fishing friends. We will have the Mirrocraft aluminum boat ready and waiting to take you for a guided fishing trip on Hemlock or Canadice Lake. We have a few minor tasks to complete and you will be able to experience the tranquility of a lake that is not rimmed with cottages. Our next surprise is that we will add Sodus Bay to the bodies of water you may choose to fish. We know that many folks make a long drive to fish Lake Ontario for trout and salmon only to arrive and find the “Big O” too rough to fish. Plan ahead and put our contact numbers in your wallet and salvage the day with a call to our guide service. The bay can get choppy, but is always fishable. Sodus Bay has every type of structure the fish like. Sunken barges, docks, weeds, points and hidden treasures if you know where to look. Bass and pike are the targeted species, with a good population of both. See what our customers have to say about Tennity's Guide Service & Fishing Charters. Find lodging in the area and learn more about local attractions. Get fishing reports, fishing tips and see trip photos from our clients. We offer guided fishing trips on Honeoye Lake and throughout the Finger Lakes Region of New York State. 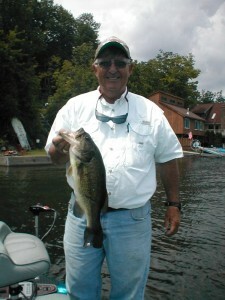 We guide for largemouth bass, pickerel, northern pike and panfish. Website by Sue B Media.